For most passengers, it’s an experience of a lifetime. It is sort of the opposite of the adrenaline rush of skydiving or bungee jumping—instead of falling out of the sky, you are floating aloft. There’s no steering wheel, so the only controls the pilot has is a valve and hot air to let the balloon go up or down, and the wind carries the balloon in whatever direction it’s going. 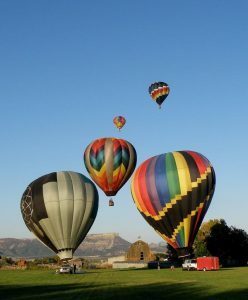 Skilled pilots can read the winds and make small adjustments to the altitude to shift direction, but basically, the balloon is beholden to the sky.